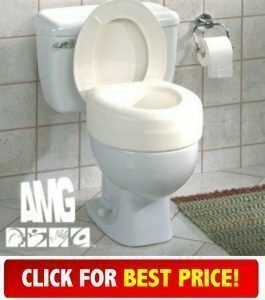 This page will give you a look at the Aquasense Portable Raised Toilet Seat White 4 Inches and tell you what to expect from this portable raised toilet seat. We will give you a full overview of the features that you’ll get and tell you our opinion of them. More importantly, we will give you a look at the customer opinion and tell you what people are saying that have purchased. These portable raised toilet seats are made from a strong polyethylene base plastic construction. It makes them super tough and will handle all the harsh conditions as all toilet seats get. Being a polyethylene construction also means that it’s seamless so easy to keep and maintain clean. You can use these raised toilet seats in any home, RV standard or elongated toilet. Easy to use all you have to do is lift the original toilet seat and lid up out the road and place the raised seat straight onto the rim of the toilet pan. Removal is so easy as using it. Just pick it up off the toilet rim and place to the side then have a standard toilet back simple hey. The seat itself is not padded but in saying that neither is a standard toilet seat. There are extras like buying a soft pad for it if you are that way inclined and needing that bit more comfort. Some people have purchased this portable raised toilet seat just for the whole camping scene and using it on a 5 gal drum for convenience. The Aquasense Portable Raised Toilet Seat White 4 Inches is so portable and lightweight you can even take it with you anywhere you travel even when using hotel rooms the RV or that luxury ocean cruise. This raised toilet seat is easy to keep clean and maintain. Same as a normal toilet seat by using bathroom cleaning products just nothing to coarse and abrasive. Mild disinfectant will be ok or just hot water under the tap. This is a great choice if you want something compact and portable! 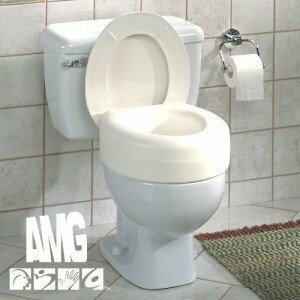 The Aquasense Portable Raised Toilet Seat White 4 Inches is an excellent budget portable raised toilet seat. If you did not like this choice then have a look at Yunga Tart Raised Toilet Seat. It’s another portable seat riser and maybe better suited for your needs? The customer opinion of the Aquasense Portable Raised Toilet Seat White 4 Inches is very good and you will see that it has mainly 4 to 5-star feedback. when you buy this seat you will notice how lightweight and portable and stable it is. The downside is that some people said that it didn’t fit their toilet base quite well. Our opinion is this is a great choice and you will love it. If you want a great portable, cheap and easy raised toilet seat then check out the Aquasense Portable Raised Toilet Seat White 4 Inches.